The Philadelphia Water Department joined partners in kicking off major improvements coming to Fairmount Park’s Centennial District during a ground breaking ceremony on Thursday, April 20. Representing the first phase of the Centennial Commons project—an ambitious plan connecting nearby Parkside residents to the area of West Fairmount Park that once hosted the famed Centennial Exhibition of 1876—the event took place at 41st Street and Parkside Avenue. This initial phase of the project includes Green City, Clean Waters investments that will bring natural landscaping features to the upgraded park. Mostly managing stormwater from the streets of the adjacent Parkside neighborhood, the series of new rain gardens, featuring native plants, will keep millions of gallons of polluted water out of local waterways each year. What happens when the nation’s boldest green infrastructure program meets the nation’s boldest mural arts program in a vacant West Philly lot? The public is invited see for themselves at the Heston Rain Garden Mural Dedication & Ribbon Cutting event, to be held on Wednesday, October 5 at 3:30 p.m. at 55th and Hunter streets in the Hestonville neighborhood. Join Philadelphia Water, Parks and Recreation, the Mural Arts Program, Councilman Curtis Jones, the Hestonville Civic Association and community members in celebrating the first Green City, Clean Waters vacant land transformation, a project that turned an empty lot into a green space that manages stormwater, protects local waterways, and features a vibrant water-themed mural from Philly artists Eurhi Jones and Mike Reali. Embrace the Rain: Get in on Our Rain Check Program Today! It seems as if everyone in Philadelphia has had enough of the wet spring we've been having. Picking up on those soggy feelings, CBS Philly did a short segment on one great way to cope with all the showers—our Rain Check program. While being part of the Rain Check program won't chase the clouds away, you can help to keep excess stormwater out our sewers and protect Philly's rivers while getting a free barrel or reduced-cost downspout planter, rain garden or permeable patio. Water collected in rain barrels can be used for things like watering flowers, and planters and rain gardens are a great way of adding landscaping to your property that also happens to protect the environment. Click here to learn about other green home improvement projects and to sign up for a Rain Check workshop that will help you find the right stormwater tool for your home! Landscaping That Helps Our Rivers? Tune in to ‘Radio Times’ Tomorrow and Get Inspired! Concrete and asphalt — not exactly materials you associate with the beauty of spring in Philadelphia, right? In addition to being unpleasant to look at, these materials contribute to the urban “heat island” effect, amplify noise pollution, and divert water from storms into our (often overwhelmed) sewer system instead of allowing it to slowly filter into the ground naturally. That last problem—the water-repelling or “impervious” nature of roofs, driveways, sidewalks and concrete-covered backyards—is something that Philadelphia Water has been working to address through our Rain Check program. By educating and working with homeowners through Rain Check, we’ve made hundreds of properties in the city not only more beautiful, but also better at managing stormwater that can damage homes and pollute our waterways. We’ve also given away over 4,000 free rain barrels to Philadelphia residents since 2006. The map above outlines some of the proposed improvements at Morris Park in Overbrook. Click for a larger image. The design for improvements that will be presented at Papa Rec Center tonight at 6:30 p.m. are for a project that disconnects several streets in the Overbrook neighborhood from the City’s combined sewer system, sending clean water to the adjacent park’s creek. As part of the Green City, Clean Waters program, this collaboration with the Philadelphia Parks and Recreation department and the Department of Public Property adds natural landscaping to the park while taking pressure off the combined sewer system. 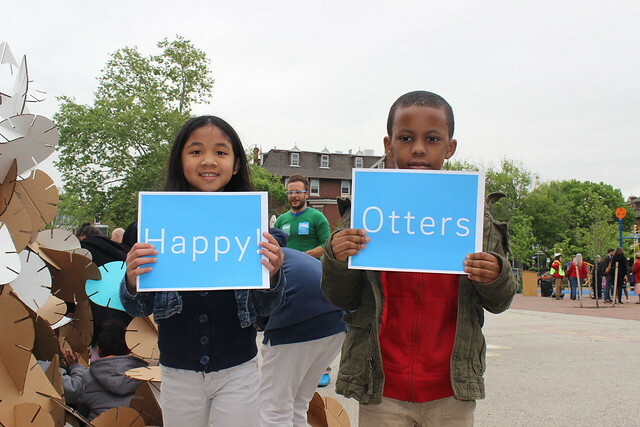 We want to hear from Point Breeze residents as we explore plans to turn two vacant lots into green space that will make Philly's rivers cleaner. You’re invited! Join Philadelphia Water and Councilman Kenyatta Johnson’s office to discuss plans for rain gardens on two publicly owned vacant lots in Point Breeze. Rain gardens are specially designed gardens that soak up stormwater when it rains. 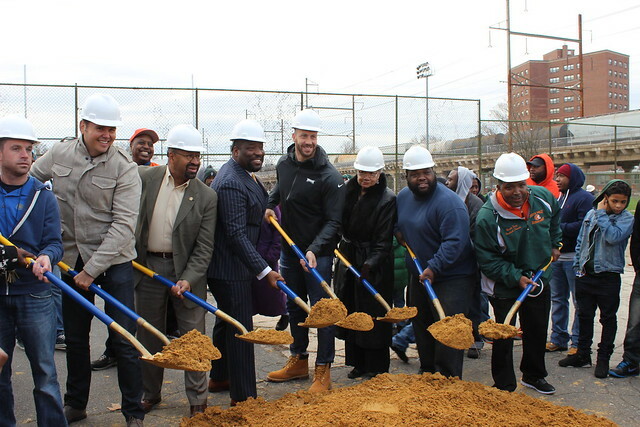 Philadelphia Water joined other City partners and Philadelphia Eagles linebacker Connor Barwin in breaking ground on a Smith Recreation Center makeover that includes extensive green stormwater infrastructure. Click the image above to see more photos from the event. You might think it’d be hard for green stormwater infrastructure to get much attention when you have a star NFL player (Connor Barwin) talking about fun things like a completely renovated recreation center and the new athletic fields and basketball courts coming to Smith Playground in South Philadelphia. Hestonville residents and representatives from Philadelphia Water break ground on a Green City, Clean Waters project at 55th and Hunter streets. Volunteers will gather for a community paint day to begin a mural planned for the wall seen in the background. Credit: Philadelphia Water. Set for completion in spring 2016, the mural will overlook and highlight a Green City, Clean Waters project that will bring a rain garden and storage trench to a vacant lot at 55th and Hunter Streets. The mural was designed with input from neighbors who requested that art be included in the project during community meetings about plans for the site. "Your Hands Shimmering" is also part of the citywide Philly Water Art program, which uses creative works of public art to engage residents and connect them to green infrastructure projects that tend to blend into city streets or are hidden beneath the pavement.